COMMUNICATION SKILL IS THE LIFE OF EDUCATION. Conducting job-oriented courses, using own invented, registered, advanced technology to train competent and scholarly teachers etc. 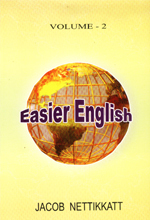 Comments about our Spoken English course. The mysterious weaving of the English language. 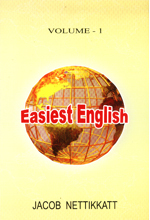 New book � for free reading. 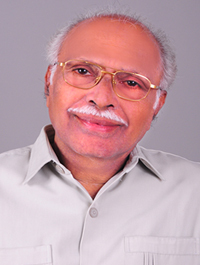 Research - views of Mr. J.N. The Inventor of Orginal Communicative English, five other brand new inventions and a new thesis on language teaching. 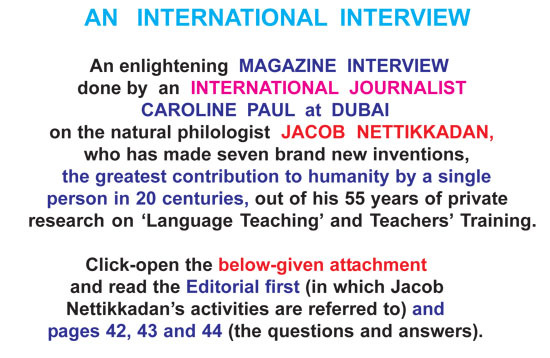 Jacob Nettikkadan (JN), alias Jacob Nettikkatt, a natural philologist living at Kaloor, in Kochi, India, is the inventor of seven brand new items in Languages and Language Teaching Fields out of his 56 years personal research at his home, as a hobby. Ultimate objective :'To make every learner of every new language speak and write it fluently and confidently in 5% to 10% time, efforts and money'. 5 books, for ON LINE READING : Cost US $.7.00 (Ind. Rs.430/-). 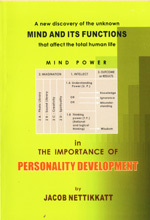 5 books, for OFF LINE READING : US $.16.00 (Ind. Rs.960/-). After the ‘Launch Offer’, these five books will cost US 16.00 (Ind. Rs.960/-) for ON LINE and US $.25.00 (Ind. Rs.1.500.00) for OFF LINE READING. N.B. Books for ON LINE READING may be delayed by a	few weeks. Books for OFF LINE READING on your computer will be supplied as soon as you remit the money into our bank account, under ‘PASSWORD RESTRICTED OPERATION’ to be used only by you. If you pass on the contents to anybody else, you will be liable for legal action and minimum punishment of Rs.50,000 (Rupees Fifty Thousand only) against violation of the condition. Also read the heading "Books & Book Purchase in the same website to know the procedure of remitting money to us. To read letters to the Edn. Min. and SCERT - Click here. 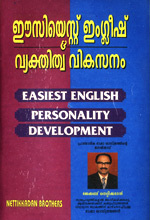 Malayalam is the most scientific and easiest language in the world as per the Linguistic Yardstick invented by Jacob Nettikkadan. Asianet T.V. news cast on October 4, 2002 (at 1.00 p.m.) confirmed it. But our declared experts and scholars may take a few centuries to realize it. However, you can be proud to ratify it, if you read item No.10-B in the above given list. Those who read item No.10-A "Learn Uni Lingua instantly" first, can have ten times greater conviction and philological knowledge.